On March 11, 2015, the power of high school students was featured in Rolling Stone, in an article by Rebecca Nathanson. The national fight for public education is growing! And more people are paying attention to students who are organizing to fight for the public education that they have a right to. The article chronicled an important slice of student organizing that has flourished in 2015: the Newark Students Union occupation of Superintendent Cami Anderson’s office to demand that she resign and meet with community members (she hasn’t attended a Newark Public School System board meeting in over a year), the founding of the Chicago Students Union, and the ways that students from across the country have connected through the national attack on public education. 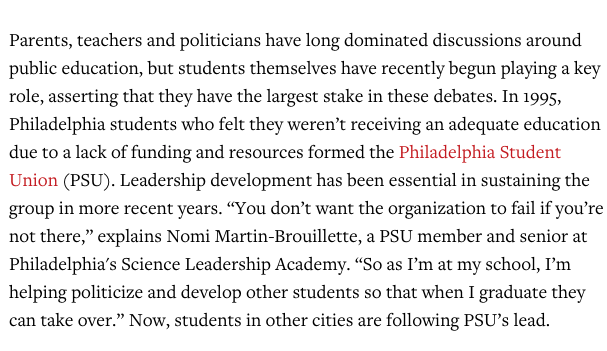 PSU member, Nomi Martin-Brouillette is quoted in the article as well. We are excited about the movement for public education with students at the forefront! For any press requests, contact our Youth Media Organizer, Beth Patel: beth@phillystudentunion.org.